The moment I walk into a Pier 1 store, I head straight to the candle section. There is always a new scent to smell and maybe… just maybe… I’ll end up purchasing one to review. Vintage Linens was a fragrance that intrigued me the moment I smelled it. The crazy part, it was floral scent but not your average sweet and heavy floral. It was soft, fresh and powdery – and very beautiful. 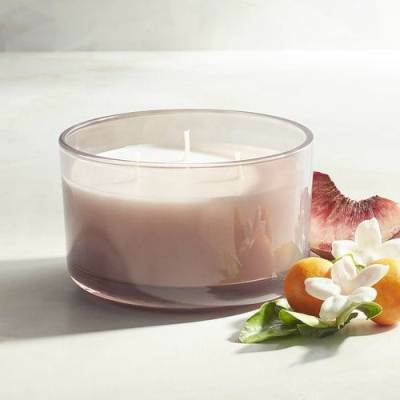 The timeless clean scent of heirloom linens is captured in this blend of orange blossom, sweet mimosa and white hyacinth, intermingled with rose petals, night-blooming jasmine and white peach. That’s a lot of different notes going on and yes, this fragrance is predominantly floral but so much more. My first observation… I don’t smell any rose in this fragrance. If I did, I would never have purchased it. Rose and I are simply not on friendly terms. What I could smell was the night-blooming jasmine with orange blossoms and hyacinth. All that blended with the white peach and sweet mimosa really toned it all down leaving behind a fresh and powdery scent. It was very feminine and girly, and I’m happy to report… not an old lady in sight. Loved! Now time to light my candle! I lit this candle in my master bedroom to start out and about 6 hours in, I ended up moving it to a smaller medium size room for a stronger aroma. Once moved… perfection! The fragrance… a wonderful and powdery floral filled my guest bedroom. I keep going back to the word powdery because that’s what it smelled like to me. A powdery and soft floral that was fresh and elegant all at once. I smelled a sweet mimosa and white peach blended with night blooming jasmine and white hyacinth with maybe even a touch of vanilla. All blended together smelled like Vintage Linens. Loved it! Strength – I would rate this candle a 6 out of 10 in a really large room. 8/9 out of 10 in a medium size room. I definitely recommend medium to smaller rooms with this one. This candle was very slow burning, but it did reach a full melt pool with each new lighting. No wick issues. Clean burning from beginning to end. Great candle. I loved Vintage Linens from Pier 1 and could totally see myself purchasing this candle again. It really surprised me and yep, it’s floral!! Go figure. Definitely check out this fragrance next time you’re at a Pier 1 store. I recommend it to floral and fresh lovers alike. It’s a keeper. Sounds yummy. I always head straight to the Candle section in Pier One as well. Their candles are so good and the prices are good as well. Thanks for the review. Will look for this one next time I am in Pier One! If you love fresh floral scents, you’ll love it. If you purchase one, let us know what you think.